Atmo Sfera is a “platterless” turntable | What Hi-Fi? Think a turntable with a heavy platter will produce better sound quality? The Atmo Sfera laughs in your face. You may be familiar with what a turntable looks like - plinth, platter, tonearm... it’s a familiar construction that has worked well down the years. However, Italian design company Audio Deva has taken away the platter, claiming that its Atmo Sfera turntable can deliver “audio quality barely surpassed even by the most sought after turntables”. The thinking is that traditional turntables are essentially gigantic springs which absorb energy, then release it as vibrations and interference in the playback. To compensate for this, manufacturers tend to use heavy platters and plinths. But instead, the Italian company uses a light platter in the form of a small, low-torque motor which gives the illusion the record is floating on air. It claims this reduces vibrations because there’s no platter or mat for them to flow through. The Atmo Sfera is a belt-driven, two-speed turntable and has Bluetooth built-in, although it isn't clear whether this is a Bluetooth transmitter, which would let you play your records through a compatible speaker or amplifier. 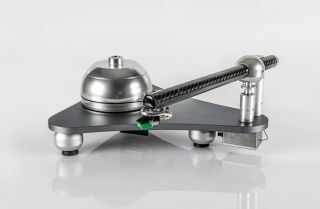 It comes fitted with a carbon fibre tonearm with an Audio Technica AT 95 E MM cartridge and has a built-in phono pre-amplifier, although this can be bypassed, allowing you to connect your own. The Atmo Sfera turntable is currently seeking funding on Kickstarter. At the time of writing, the project had raised over €11,000 towards its €40,000 goal. You can pre-order one in a Titan or Orange finish for €895.